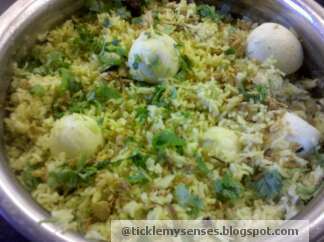 This tasty pulao is a simple and wholesome dish. It works well during the lenten season when meat is restricted. Serve with raitha, hot pickle and vegetable. 1. Hard boil eggs till well done. ( Cook for 7mins after salted water comes to boil). Shell eggs and keep aside. 2. Grind the masala ingredients coarsely in a blender. 3. In a wide and thick bottom vessel , take sufficient oil/ ghee, once hot add whole spices and bay leaf, fry till aroma arises, do not allow to burn. 4. Add ground masala and tumeric powder to whole fried spices and fry very well on a medium flame till the raw smell of onions and garlic goes away, stirring frequently to prevent burning ( may take 10 minutes). Add more oil if masala is sticking to base of vessel. 5. 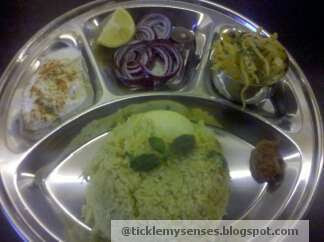 Add washed basmati rice to masala and fry well till rice begins to change colour to a whiter/ opaque shade. 6. Add boiling hot water, salt, lemon juice, 1 tsp butter( if not using ghee in recipe) and stir well . Carefully immerse the boiled eggs. Allow the rice to come to a boil on a high flame uncovered, then turn down heat to medium, cover the vessel with a glass lid and let rice cook till water is seen bubbling through holes in rice. Then turn the heat off and allow the rice to cook undisturbed in its own heat for 7-10 minutes. 7. Once the rice has rested , carefully run a fork through the rice to seperate the grains. Sprinkle the top with freshly chopped coriander, mint leaves and crispy browned onions. Serve hot with your favourite raitha, vegetable and pickle.